As I predicted last night, there are certainly many things I don’t know about inking and drawing. However, I am having a blast! My hands are ink-stained, like from grading papers, only this was a lot more fun! I need to work on writing with a brush pen (i.e., my Pentel Pocket Brush Pen). It is crude and lacks style, which was to be expected. I like the Copic multiliners I have, but need to practice using them to best effect. Don’t be afraid of said brush pen. It is great for shading larger areas, and for providing the impression of things, like the line of mountains in the distance. I feel like I am at the very first steps of beginning to start developing a personal art style for non-photographic media. Notice how I said beginning three different ways? Haha. I have a long way to go, but I am having such a great time with Inktober so far. It is challenging, but in that best of ways, that makes me excited for the days ahead. Experiment, experiment, experiment! In fact, the first page of my sketchbook is almost entirely dedicated to trying brush strokes and pens out. Anywho, enough about that. 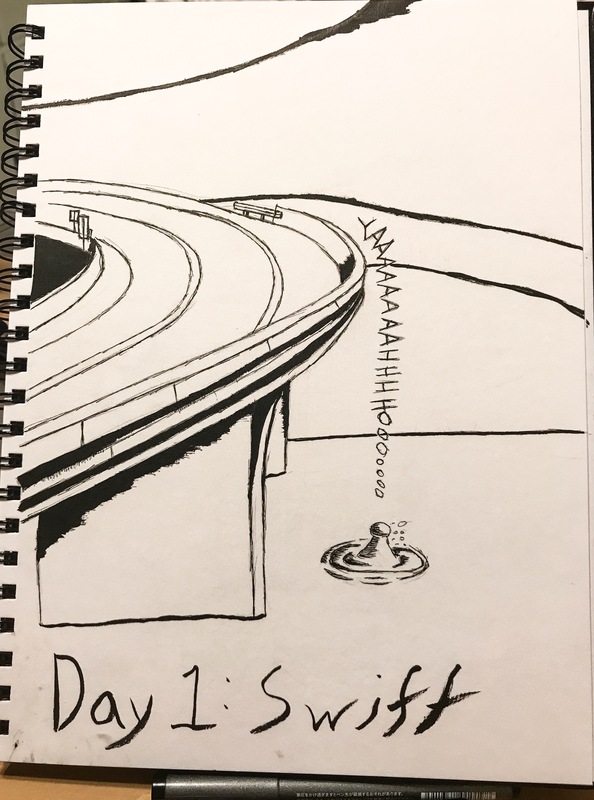 Today’s prompt was “swift,” and I drew someone leaping off a bridge into a lake, something which I am all too aware is thrilling and a swift fall, but well worth it. Well, I drew the moment after the person hits the water, technically. I hope you enjoy! Stay tuned for more about Inktober.